HTC's first tablet outed as HTC Scribe? 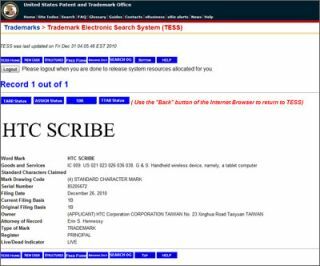 HTC's inevitable foray into the tablet market looks imminent after the Taiwanese firm trademarked the HTC Scribe name. The trademark application was filed for a 'handheld wireless device, namely a tablet computer' and the assumption is that this device will see HTC joining the Android-powered iPad rivals' race. The application doesn't give away much more than the name of the device and the date of the filing (Boxing Day, if you're interested) but we'd imagine it will be running Honeycomb and therefore have a high resolution screen and dual-core innards. We'd be surprised if the HTC Scribe name actually made it to the model we see on our shelves, as we doubt it's going to come with a pen device a la the tablets of the early 21st century. HTC looks set to announce something big at CES or Mobile World Congress this year, and in addition to the standard Desire and Legend refreshes it wouldn't be a surprise to see a new tablet turn up too. This would mean a UK release date of around March or April, and given HTC's recent track record, a not-too-ridiculous UK price could follow as well. TechRadar is patrolling the floors of CES as we speak, so if nothing turns up there we'll turn our tablet-focused laser sights to the halls of Barcelona for MWC in February.